The Town of Geraldine was incorporated in 1956. The first mayor was Mr. Raymond Upton. Councilmembers were T.A. Guest, V.W. Martin, D.G. Morrow, Leroy Porter and Earnest Upton. The first clerk was Verlon Masters. Serving as the current Mayor is an exciting and rewarding job. It has its challenges of course but anytime we can complete a project that makes life better for the people in our area it makes the work worth while. We have a great council that works hard and we are able to resolve issues in an orderly manner. Our police department's second to none. They are very professional and work hard to enforce the laws. Our Clerk, Kim Cleveland does the work of two people by serving as court magistrate as well. She also is the one that puts together this website and does anything else we ask and more. I enjoyed compiling this "brief" history of Geraldine and did not mention many, many people that had a big part in making our town a great place to live. I must acknowledge and thank Mr. Tommy Guice because much of the information here is found in a book "History of Geraldine" that Tommy compiled in 1986. Geraldine Alabama is a Town in DeKalb County, located on beautiful Sand Mountain which is part of the Cumberland Plateau separated from the main portion of the plateau by the Tennessee River, and the Sequatchie Valley. The average elevation is 1200-1500 feet above sea level, compared to about 650 feet in the surrounding area. Sand Mountain is approximately 90 miles long extending from near Oneonta in Blount County, Alabama to just north of Trenton Georgia in Dade County. Although the Sand Mountain area has been inhabited around 9000 years, the first Europeans in the area were most likely Hernando DeSoto and his men who likely crossed Sand Mountain between 1539 and 1543. On December 29, 1835 the Treaty of New Echota was signed which gave the Cherokee lands in Alabama, Georgia and Tennessee to the federal government. Eleven days later on January 9, 1836 the Alabama Legislature created DeKalb County. The United States Government began to permit settlers into the area to acquire land. The first record of someone acquiring land in the area was J.W. Croley in 1844. The first school in the area was Central School about one mile south of the current Geraldine School, built in the late 1860's. Salem School was built about 1870 one mile northwest of the current school. In 1911 the schools were consolidated to form Geraldine School. The first graduating class was 1915 with the following graduates: Bess Freeman, Charlie Martin, Ruby Porter and Pearl Rucks. The school was accredited in 1921 and was the first school in DeKalb County to be accredited. The school fielded the first football team in 1923. During the 1930-31-32 seasons the football team only lost one game. One of the players from that era, Ben McCloud, played at The University of Alabama and played in the 1935 Rose Bowl when Alabama defeated Washington 24-0. Basketball has always been a very important sport in the Geraldine community. In 1931 and 1932 Coach Guy O'Brien led the Bulldogs to win the State Championship and in 1933 the Bulldogs won the State Championship again with Coach Knight. At least 4 players from Geraldine served as captain of college teams. Ben McCloud at The University of Alabama, Porter Gilbert at Auburn, Fred Edmondson at Georgia and Ronnie Harris at Jacksonville State University. On September 5, 1882 Mr. W.A. Johnson applied for the location of a new post office. The record of the Post Office Department shows the name "Lee" was written on the application but was marked through and the name Geraldine was written. Mr. Wesley Crumley, a blind man, brought telephone service to the Geraldine area in 1904. He actually lived in Ophir about 3 miles east of Geraldine. He made the switchboard, did expert repair work on telephones as well as help put up poles and stretch wire despite his blindness since age 3. He was a graduate of Talladega School For The Blind with high honors and became an electronics expert. He also could make automotive repairs and cultivated 60 acres of land. In 1949 he sold his phone system which consisted of more than 400 phones and 300 miles of line. A social event which played an important part in the early history of Geraldine was the Nichols picnic, which was started by Charlie Nichols in 1916 and ended in 1941. At the first picnic one block of ice was used mostly to make lemonade but at the 1924 picnic 4 tons of ice was used. Barrels of red snapper fish were shipped by train from the Gulf Coast to Collinsville and then brought to the Nichols farm by horse and wagon. Mr. Nichols saying as "Come with a smile, and if you can't smile, get close to me and I will make you grin." In the DeKalb Herald Newspaper July 20, 1923 the crowd was estimated at 5000-8000. A great many very important people spoke at the picnic including Governor Bill Brandon, Governor Bibb Graves. Governor Frank Dixon, Senator Tom Heflin, Albert Rains, U.S. Supreme Court Justice Hugo Black and Howard College President Harwell G. Davis. Many games and contests were enjoyed as well as singing and instrumental competitions. Mr. Nichols passed down his love of entertaining and organizing to his children especially his son Vondell. "Mr. Vondell" was the first president of the Sand Mountain Boosters Club. He organized the first Maid of Cotton Contest and the first Ms. Sand Mountain Contest. He loved to cook for large crowds and organize fund-raising events for church, community, or education purposes. He was in charge of cooking for Easter sunrise service at Buck's Pocket for many years, which included bacon, eggs and toast cooked over an open fire on an iron griddle and grits cooked over an open fire as well. He played football at Geraldine, graduating in 1925 and then played at Jacksonville State Teachers College. He was the public address announcer at Geraldine football games for some 25 year and you always knew which team was his favorite. He announced basketball games on the radio and had a radio show on a station in Scottsboro in the 1950's which included a sports trivia contest. He taught school, farmed, was on the town council, and was employed by Mutual Savings Life Insurance Company for 33 years. He always had a joke or a trick to share and made it a mission to make others lives happier and better. Many people paved the way for Geraldine to be the great town it is today. This is not meant to be a complete list but I do want to mention a few others that had a large impact on the formation of the Town. Mr. W.A. Johnson not only was the first postmaster he also ran one of the first stores in Geraldine. His son W.R. Johnson bought the store and moved it across the road from the school. He sold it to Peter Porter who sold it to his son Leroy Porter. Leroy and his brother Arthur, great-grandsons of Mr. W.A. Johnson, operated the store for many years. It was a very friendly and happy place to go. Dr. William Preston Hick moved to Geraldine in 1914 to become the only doctor at the time. He traveled by horse and buggy before purchasing a car. Dr. Hicks put a feather bed in the back of his car to carry patients to the hospital since there were no ambulances. In 1919 Dr. Briggs Parris moved to Geraldine. He was born July 17, 1886 in Guntersville. He received his degree from Memphis Medical School and did post graduate work at Northwestern in Chicago. He taught school for four years and practiced medicine for 37 years. He not only made house calls, he encourage parents to provide proper diets for their families by producing fruits, vegetables, meat and milk at home. He worked with the County Health Department to educate the public on how to stay well. He gave freely of his time and money for the improvement of the community. He was an important part of the community from 1919 until his death in 1951. Mr. Clodie Hall served the town in various ways for over 60 years . He was a teacher, county bus garage supervisor and was a self-taught watch maker. He maintained a watch repair shop for many years. He served as a town council member and was postmaster form 1949-1974. He did a good job at everything he attempted. Certainly our town would not be what it is without our churches. On May 19, 1853 the Macedonia Baptist Church became a member of Cherokee Baptist Association, Salem Methodist Church was organized around 1865, Geraldine First Baptist was organized August 20, 1939. Geraldine First Methodist first service was September 1, 1945. Geraldine Church of Christ had their first service December 9, 1962 and we also have the Church of God. Many people wait until a disaster occurs to call on churches, but the churches are always ready to respond to help meet the needs of others. Hundreds of people have given money and time to make Geraldine what it is today. We have a great school, a beautiful park with a lighted walking track, ball fields, splash pad, tennis courts, basketball courts, pavilions and according to the 2012 census, 896 residents. In April 2013 we received a grant to build a sewer system which will greatly improve the quality of life for our people . Look for updates as they are available. Remember "If you are fortunate enough to live in Geraldine, you are fortunate enough." 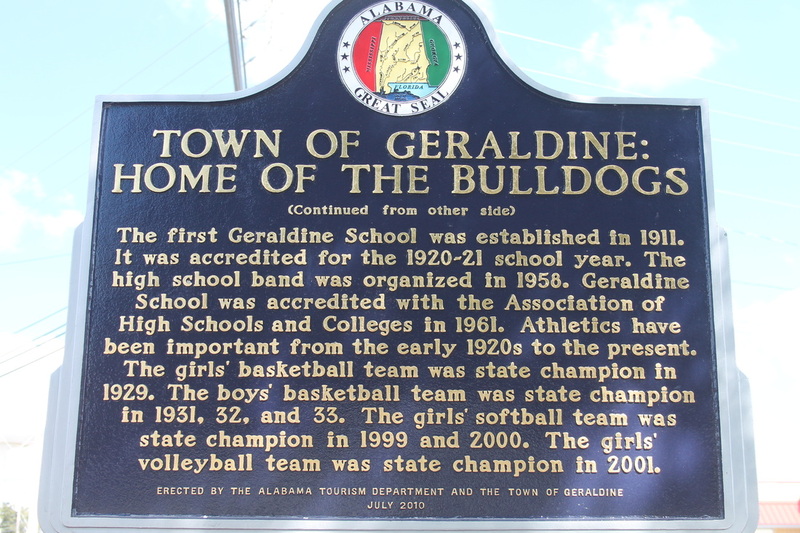 For more information concerning the history of Geraldine, click on the link below to access DeKalb Landmarks. In 2006, the historical marker shown below was dedicated and placed in front of the Town Hall.